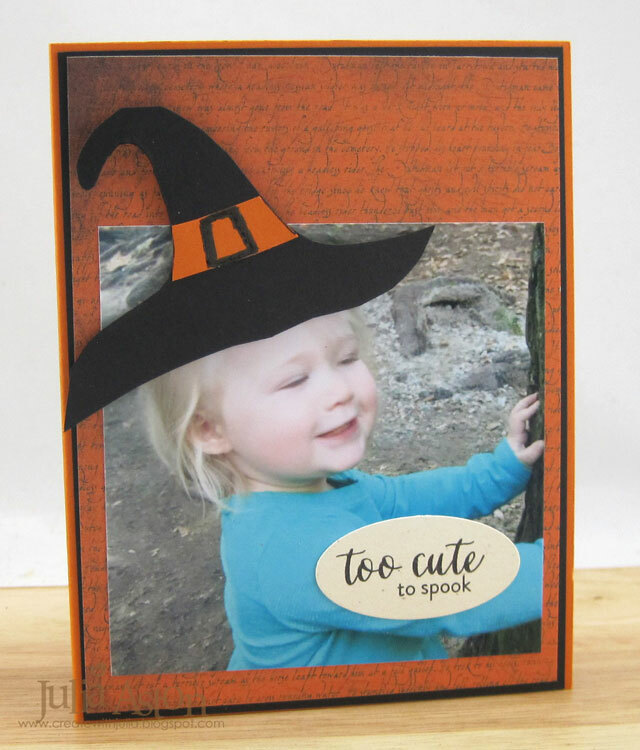 Create With Me: Happy Halloween to the Kidlittes! I love to make personalized cards for my grandnephews and grandnieces by using photos of them on their cards. 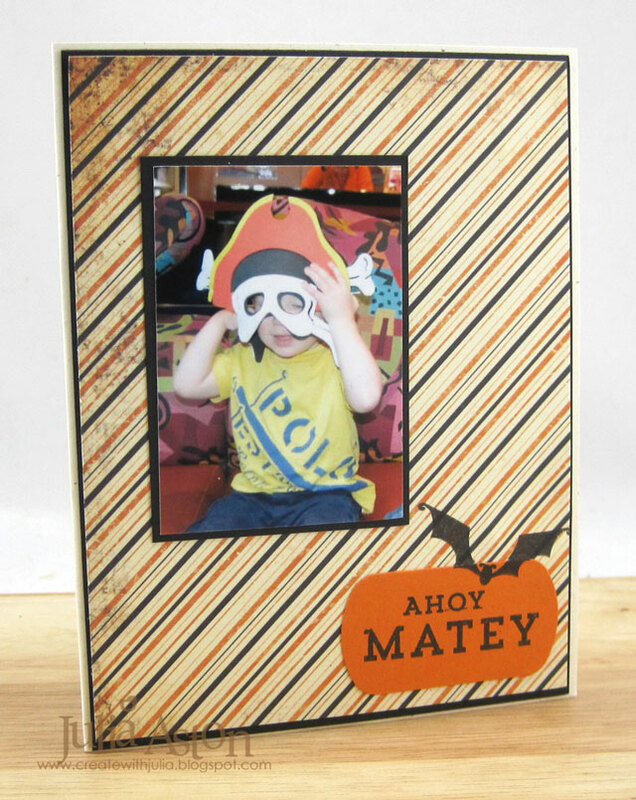 Today, I'm sharing the cards I made them for Halloween this year. I usually look into the Snapfish or Facebook albums my nieces load their photos into to find the photos I will use. This super fun pic of 4 year old James (see his head in the cauldron with the pumpkins?) was taken recently on their visit to Quebec for his great grandmothers birthday. I just framed the photo in black and terracotta and added a sentiment from Peek a Boo Sentiments by Waltzingmouse. For James' sister, 1 1/2 year old Madelyn, I used a cute photo of her from the same trip to Quebec and added a hand made witches hat - with another sentiment from Peek a Boo Sentiments. Here is 5 year old Landon - but he's younger than that in this photo - I couldn't find a newer one that fit for Halloween. I thought this sentiment, a combination of two stamps from Ocean Bound by Waltzingmouse, worked perfectly with the pirate mask! The bat stamp is from Halloween Party. And last, but not least - here is 3 year old Mila, Landon's sister. I added a stamped and die cut witches hat and pumpkin from Tim Holtz Crazy Things stamp and die sets. This is a photo from when they went apple picking this fall. 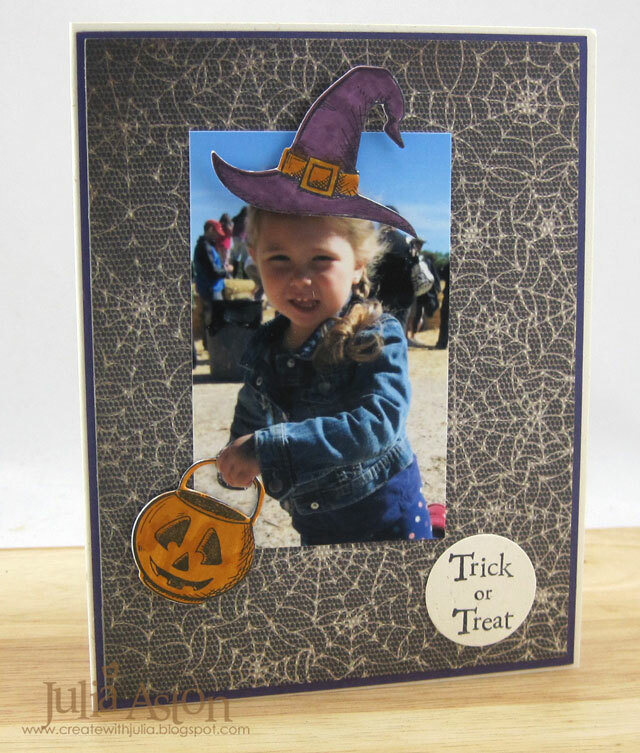 Julia what fun Halloween cards to give to your grand nieces and nephews! Happy Halloween! Tee hee - love how you've incorporated the family photographs into your Halloween cards, Julia... the one being stirred into the cauldron is my absolute favourite!! awwwww...these are all fabulous Julia! Oh My!! 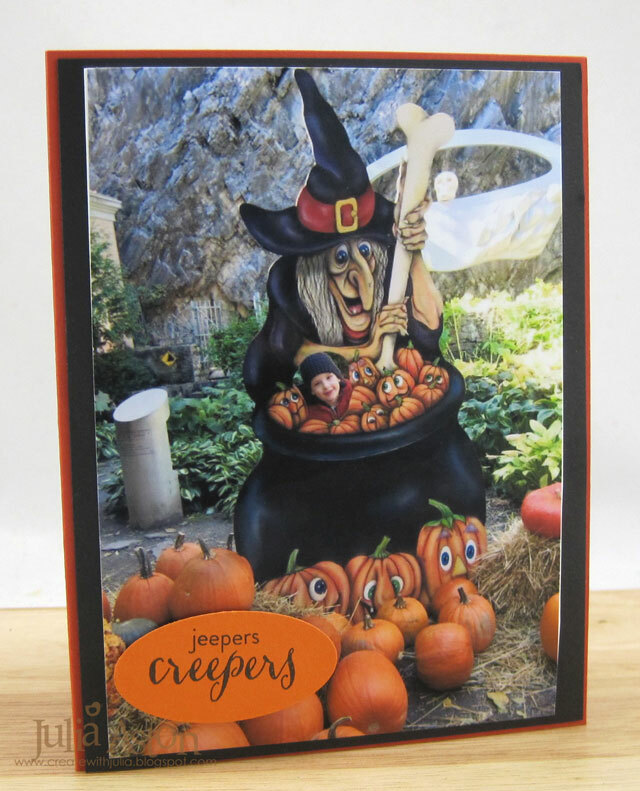 What a nifty idea - I laughed out loud when I realized one of the kids was a pumpkin in the caldron! WOW! Very creative - thanks for the inspiration!